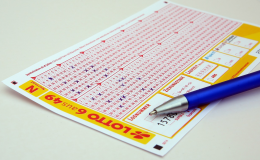 The Lotto-Domain is an exclusive Domain which can be registered only by official lotto societies. The Sunrise Period of the Lotto-Domains has ended on 22nd of August, 2015. The Landrush Period of Lotto-Domains has been closed on 3rd of September 2015 at midnight. Every Lotto-Domain costs in the general Availability 1785 US-$ per domain and year. The Lotto-Domains are distributed according to the principle "first comes, first serves". In addition to the completed application legitimate applicants should send us the "token" of Afilias, which they have already got by Afilias. By clicking at the button, you confirm a free, but binding pre-registration of (a) New Top Level Domain (s), which will cost at succesful registration 1785 US-Dollars/domain and year (if not a Sunrise Domain oder a Landrush Domain, which are more expensive) and that you have read and accepted Trade Conditions, Registrants Rights and Responsibilities, the Uniform Domain Name Dispute Resolution Policy and the policies of the registry. SSL Certificates only 14 US-$O!